Many women are deferring childbearing until they have the perfect partner and an established career. It's a big mistake. While an estimated 5 million babies have been born with the help of ART since 1978, millions more couples have experienced the failure of this still fragile science. Miriam Zoll, an American human rights activist, found herself whirling around on the IVF merry-go-round at the age of 42. She chronicles this time in her recent book, Cracked Open: Liberty, Fertility and the Pursuit of High Tech Bagbies. MercatorNet interviewed her by email about her experiences. MercatorNet: Can you tell us how you came to write this book? Cracked Open began as a journal when my husband and I first entered into ART treatments in the United States. By that time I was 42 and we had tried unsuccessfully for several years to become pregnant naturally. Like millions of couples around the world who turn to fertility science for last minute miracles, we were both initially very optimistic about the power of reproductive technology to reverse my age-related infertility. During our first meeting with the endocrinologist, we were told that our chances of having a baby through in-vitro fertilization (IVF) were very low, but our doctor also reminded us that it “only took one good egg to make a baby.” He explained that there were new techniques and drug protocols constantly being developed and that you never knew what could happen. In essence, he invited us to roll the dice with him––to gamble on hope––and we accepted his invitation. Hope is a very potent emotion for people facing a diagnosis of infertility. I believe that the current trend among mostly middle-class educated professional women to delay childbearing has evolved, in part, from that kind of sensationalized media coverage about the technologies. My journal turned into the first drafts of Cracked Open after our fourth IVF cycle failed. The doctor had prescribed a potent egg stimulating drug protocol for me, and he was confident it would generate a larger number of eggs. That month, perhaps for the first time in my life since I began menstruating at the age of eleven, my body produced no eggs at all. As I sat in my car in the clinic parking lot, I realized that the limitations of this young and fragile science were far greater than most people realized, myself included. That’s when I knew I needed to write Cracked Open. MercatorNet: In retrospect, what are the main ethical quandaries that you see in the process of IVF? MZ: There are many ethical quandaries I encountered with IVF treatments, and later egg donation. I am deeply alarmed about the growing commodification of conception, and women’s reproductive capacities and organs via commercial surrogacy and egg vending. In addition, the lack of transparency and open exchange of information between the clinic and patients/consumers present many ethical concerns as well. Some people have scolded me for being a passive patient, saying that it is my job, not the clinic’s, to research fertility treatments and understand the risks––physically, emotionally and spiritually. But for anyone undergoing treatments, fully understanding these risks and sorting through treatment options would require a medical degree and then some. The average couple seeking help to have a baby doesn’t have that kind of background. In my case, by the time I walked into the clinic, I was so confused and distraught that I had believed it was safe to delay childbearing that I surrendered completely to the experts and followed their advice. My husband and I did not learn until after we completed treatments that globally, 77 percent of ART cycles fail annually, or that in the United States in 2010, almost 70 percent of cycles failed. Most clinics, including ours, highlight their success rates, and many feature pictures of cute babies surrounded by smiling moms and dads on their websites. Patients/consumers are mainly exposed to the positive aspects of treatments. They don’t necessarily understand the depth and degree of the bioethical and human rights complexities–– or traumas––associated with this particular branch of medicine. Unfortunately, many don’t learn until after they have invested enormous hope, time and money, and are so embedded in the process that they can’t bear to turn back. Another striking ethical concern for me is the lack of evidence-based research tracking the long-term health of women going through treatments and the babies born from them. There have been many short-term studies conducted, for example, about associated risks between certain fertility drugs and cancers in women, like breast, ovarian and endometrial cancer. And there have been some studies indicating a 25 percent increased associated risk of birth defects in IVF babies. But for every study making a connection, there are others that say there is no connection. In the United States, the only long-term research study I am aware of is based at Dartmouth-Hitchcock Medical Center. It is called the Infertility Family Research Registry. IFRR is a voluntary registry that allows women going through ART to submit information about their health and the health of any offspring resulting from treatments. Even though today the American Society for Reproductive Medicine and the Society for Assisted Reproductive Technology sponsor the registry, very few clinics are sharing information about its existence with their patients/consumers. Of the roughly 500 clinics in the US, fewer than 100 have signed up to actively promote it. My question is, why is that number so low? Women and infants’ health is at stake. It should be a priority. MercatorNet: Some opponents have criticized IVF for being “dehumanizing” for both spouses. Is it? MZ: I think my husband and I both felt that the treatments were dehumanizing––but I don’t think they have to be. There is enormous room for improvement in the way some fertility clinic staff support the needs of couples facing a diagnosis of infertility, and the ways in which staff engages with them during grueling and invasive ART procedures. In our case, we experienced a level of detachment from staff that did not match the intensity of what we were experiencing and hoping to accomplish. The staff, for the most part, did not acknowledge the grief and pain associated with our failed cycles, including one miscarriage. Even when I tried to engage some of them in discussion about what I was feeling, they quickly shut the conversation down. It is clearly in the best interests of people undergoing treatments to know that many fertility procedures are experimental and lacking in evidence-based research. They also have the right to know that the emotional trauma they may encounter can be significant, leading in some cases to Post Traumatic Stress Disorder. There were times during my treatments when I certainly felt like a guinea pig. Other women have reported in studies that they felt like they were “pieces of meat” and guinea pigs, as well. Among the many questions that need to be asked, two are: How can patients become their own best advocates and safeguard their wellbeing while going through these invasive treatments? And, how can clinic staff better support patients’ wellbeing during these treatments? The word “wellbeing” is key here because these life-altering procedures penetrate the whole person -- body, mind and soul. MercatorNet: Is the IVF fertility industry exploiting women by drawing them into a “crapshoot”? MZ: The hope and potential of assisted reproduction is incredibly alluring and seductive. Around the globe today there is enormous confusion and misinformation about women and men’s natural fertility peaks and declines. Millions of predominantly middle-class, educated women are anxious when they do delay childbearing, and many assume ART can be their safety net. Many members of the reproductive science world and mainstream media prematurely endorse reproductive technologies before adequate safety and efficacy studies have been conducted. The way egg freezing has been marketed and promoted by clinics and the media in the last year is a perfect example. It has been packaged to be as revolutionary as the Pill. As a result, many women view it as some kind of magical insurance policy that will enable them to safely birth babies when they are older. But these claims are unfounded. Only an estimated one thousand babies have been born to women younger than 30 who froze their eggs, and we have no idea what kind of long-term health affects egg freezing may have on the babies. A May 2013 patient data meta analysis published in the journal Fertility and Sterility revealed a 77 percent failure rate for 30-year-old women using the flash freezing technique known as vitrification; using the slow freeze method, the failure rate was 91 percent. In women aged 40, there was a 91 and 96 percent failure rate, respectively. While the flash freezing technique appears to be somewhat more effective in younger women, it by no means guarantees motherhood at any age. With regard to IVF in the States, clinics are not required to report their failure rates or the number of IVF cycles performed per woman per clinic. Yet for couples grappling with fertility issues, this information is absolutely essential for them to be able to make informed and thoughtful decisions about ART and the impact it may have on their physical and mental health, life plans and finances. I know couples that endured a dozen or more failed cycles, spent all their savings and kept going back for more. Why? Because they were not aware that the technology’s failure rates were so high. Many women blame themselves instead. From personal experience, I can attest to the fact that the hormone regimens, miscarriages, stillbirths and negative pregnancy tests have an extremely negative and long-lasting traumatic affect on women. Treatments can be devastating and recovery can sometimes takes months if not years. MercatorNet: At one point in the book, you mention the IVF industry’s “money lust”. Isn’t this a bit extreme? MZ: Unfortunately, based on my experience, I don’t think that phrase is too extreme. There are many well-intentioned professionals working in the field of reproductive medicine who are genuinely interested in helping couples build their families. But most clinics are medical businesses, and the staff tends to wear both medical and business hats simultaneously. Many doctors, for example, provide patients with medical advice and information while also trying to persuade potential customers to utilize new reproductive technologies or drug protocols. From a business perspective, they have to do this to meet their bottom lines and build their profit margins. Patients and health consumers need to be aware of this. Earlier this year, for example, Virtus Health in Australia became the first IVF company to go public to the tune of half a billion dollars. Its chief executive, Sue Channon, has a tough job promoting both Virtus’s business and medical portfolio. On the corporate front, Channon is quelling investors’ fears that improvements in ART might mean fewer cycles for clients––and therefore dwindling revenues. But she assures shareholders not to worry: to attract more customers, Virtus plans to reduce the costs of some fertility treatments and to expand geographically. Expansion is primarily focused on new markets in the Middle East, China and India––where US and European demand for commercial surrogacy, in particular, continues to grow rapidly. My husband flagged the business side of reproductive medicine long before I did, in large part, I think, because I was obsessed in an unhealthy and addictive way with becoming pregnant – to the point where I refer to myself in my book as a “fertility junkie.” I was very, very focused on the drugs and procedures and did exactly what the doctors told me to do. I couldn’t afford not to trust them. I thought that if I tried harder, if I thought more positive thoughts or practiced more yoga or improved my eating habits, that the treatments would eventually work. MercatorNet: Your story is sometimes so filled with pain that I could barely continue reading. Is the process really that bad? MZ: Yes, for me, the process really was that bad. I have since spoken with many other women and men who have gone through treatments. The women’s stories are quite similar to mine, in the sense that they felt the treatments maimed them, changed them, and immobilized them. MercatorNet: How do you feel about the burgeoning surrogacy industry in countries like India? MZ: I am deeply concerned about putting a price tag on women’s reproductive labor and organs. At the same time, as someone who experienced the grief and panic of infertility, I also understand why some couples look to surrogacy or egg donation as a solution. Over the last three decades, third-party reproductive technologies like surrogacy and egg donation have been normalized to the point where people incorrectly assume the procedures are always safe and equitable. I don’t necessarily believe that couples contracting a surrogate or egg donor are aware of the extent of the risks and hardships many of these women face. I certainly wasn’t. There is a wonderful new film produced by SAMA, the well-respected, India-based women’s health and human rights organization, which provides a glimpse into the expanding surrogacy business there. In its film, “Can we see the baby bump, please?” they go behind the scenes and interview surrogates. Illiterate and often recruited from the slums, many, it turns out, are not fully aware of the processes and procedures they have consented to. Many surrogates are separated from their children and families for up to a year. They often live in “surrogacy dormitories” where their diets, activities and movements are closely monitored by the doctors and staff. Some do not understand that they must submit to hormone therapies and IVF procedures that may pose risks to their physical and mental health. At one point in the film there is a very disturbing image of a dozen or so very pregnant women lying around on cots. They truly look like pregnant animals on a farm. If a pregnancy fails, it is not uncommon for the clinic to blame the surrogate, and in some cases, compensation and follow-up health care may be withheld. Some proponents of commercial surrogacy and professional egg vending believe these “jobs” represent positive employment opportunities for women because it enables them to earn money they might otherwise not be able to earn. This is currently being debated in California through Assembly Bill 926. But such propositions specifically target poor women and expose them to potentially serious health risks. In Spain, for example, there has been an increase in the number of poor women donating their eggs as they struggle to make ends meet in the face of unusually high unemployment rates. As someone who has studied the link between poverty and gender, I would much rather see women and girls acquire economic security as a result of educational access, constitutional human rights protections, and sustainable employment opportunities that are not singularly focused on their gonads and wombs. MercatorNet: Do we place too much confidence in modern medicine’s ability to fix our physical failings? MZ: This is a very important and deeply personal question, and one that my husband and I talk about quite a bit. In hindsight, we now recognize that we did place too much faith and confidence in reproductive medicine. We did this, in large part, because we did not have access to a wide spectrum of information about ART. The information and advice that was available to us–-from the media, the internet and from our healthcare providers–-was almost always biased in favor of the science. Everyone in our social sphere assumed IVF would solve our fertility challenges. We all believed it would succeed. No one warned us about the potholes we might fall into because no one was aware they existed. Unfortunately, I did not come into contact with objective women’s health and human rights information provided by groups like Our Bodies Ourselves and the Center for Genetics and Society until after I completed my treatments. One of the reasons I wrote my book was to provide an alternative voice of caution, a more balanced perspective about the opportunities, risks, limitations and bioethical conundrums associated with ART. I raise many questions in my book but I certainly don’t claim to have all the answers about this complicated phenomenon. I do encourage people who are contemplating assisted reproduction to become informed and discerning patients/consumers. I recommend they speak to people who have endured treatments—both those who birthed healthy babies and those who didn’t. One-sided endorsements can be very misleading so people need to weigh the pros and cons for themselves. I also encourage women who are thinking of delaying childbearing to determine if that is even an option for them. Every woman’s capacity to reproduce is different, and some women might be able to safely delay while others can’t. While it is not foolproof, I suggest women have their hormone levels tested when they are young, and keep testing them. Seek out the advice of more than one independent reproductive endocrinologist who has no ties to pharmaceutical companies, fertility clinics or donor egg agencies. In this age of inaccurate information, women need to guard and protect their fertility. MercatorNet: Many couples are afraid of adoption. What would you tell them? MZ: Parenting a child is about love, not blood connection. Parenting is a spiritual path, a giving path. Being an adoptive parent is the most fulfilling and rewarding experience of my life. My son sprang forth from my husband’s and my hearts, from our long-held faith and desire that in the midst of this crazy world we would find him, and he would find us. Our love for him is boundless, limitless. My maternal instincts kicked in the very second I laid eyes on my son when he was four-days-old. The gratitude I feel toward his birth mother––who loved him deeply and had the courage to place him in our loving arms––is profound beyond words. 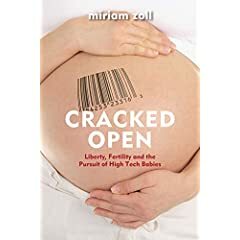 Miriam Zoll is the author of Cracked Open: Liberty, Fertility and the Pursuit of High Tech Babies. She is the founding co-producer of the Ms. Foundation for Women’s original “Take Our Daughters To Work Day” and a member of the board of the global women and girls' health and human rights organization Our Bodies Ourselves. This article is published by Miriam Zoll and MercatorNet.com under a Creative Commons licence. You may republish it or translate it free of charge with attribution for non-commercial purposes following these guidelines. If you teach at a university we ask that your department make a donation. Commercial media must contact us for permission and fees. Some articles on this site are published under different terms.